Bwindi Impenetrable National Park is located in south western Uganda and covers an area of 331 square kilometers, situated on the edge of the Western Rift Valley-the park occupies the highest part of the Kigezi Highlands. Bwindi Impenetrable Forest lies along the border of the Democratic Republic of Congo, about 30 kilometers by road northwest of Kabale town and 35 kilometers north of Kisoro town. The park is a home to approximately 480 endangered mountain gorillas, which constitutes approximately half of the world’s population. The park facilitates gorilla tourism which has become the favorite tourism asset for Uganda, birding safaris for birders, cultural safaris and wildlife. Expect four hours of face time with the giant cousins, watching mountain gorilla in their natural habitat is once in a lifetime encounter. 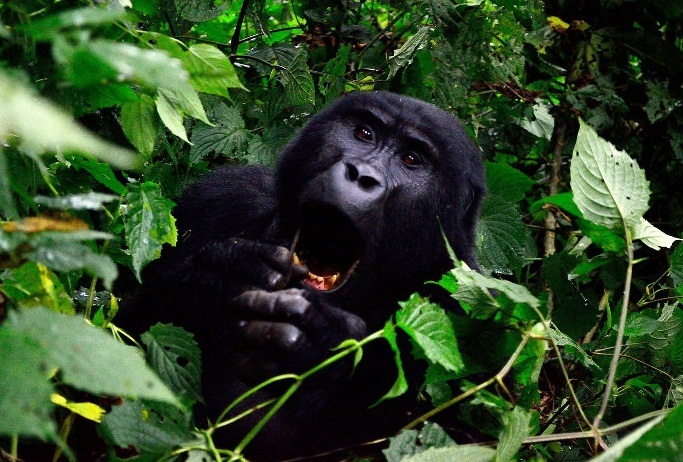 Gorilla habituation encounter can only be done in Uganda’s Bwindi Impenetrable National Park and is not available in Volcanoes National Park in Rwanda or Virunga National Park in the Democratic Republic of Congo. It is approximately 9-10 hours drive from Entebbe Airport to the Rushaga Gorilla trailhead of Bwindi Impenetrable National Park, 1 hour and 30 minutes drive from Kisoro Airstrip and 3 hours drive from Kigali Airport to the Rushaga area.